Any cat ladies out there? 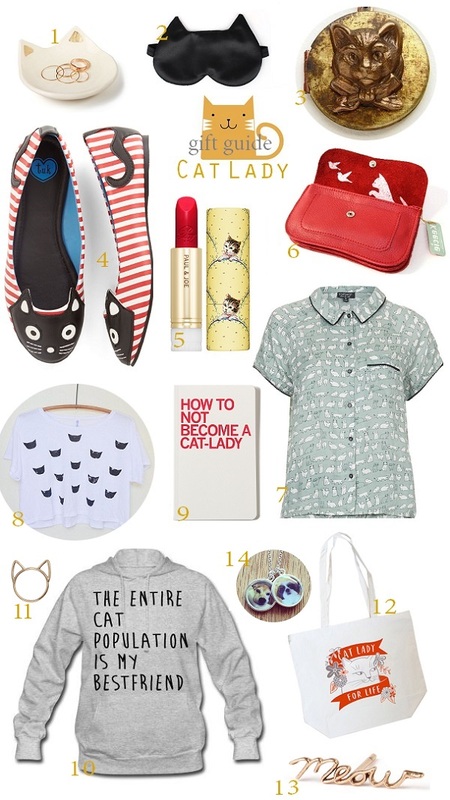 Today's gift guide is for all those wonderful cat loving girls in your life. From your beloved aunt who wears cat slippers, your work-desk buddy who drinks her morning coffee from a cat mug, to your mom or sister who's eyes light up around their purring pets. 1. Ring dish ($22), 2. Cat eye mask ($24), 3. Vintage cat locket necklace ($32.50), 4. Cat flats ($60), 5. Paul & Joe lipstick and their lipstick cat case ($27), 6. Cat chase wallet ($74), 7. Cat print pyjama set ($52), 8. Leah Goren cat tee ($45), 9. Cat Lady notebook ($5), 10. Best friend hoodie ($46), 11. Love cats ring ($32), 12. Car Lady tote ($20), 13. Meow stud ($154), 14. Custom pet portrait pendant ($35). P.S: Also, a gift guide for a person who loves all things organic and natural and the honey lover in your life. P.P.S: Fancy a beautiful necklace, a pair of earrings or a bracelet? Don't miss our Edor GIVEAWAY this week! My husband and I are dog people but I have at least 2 friends that I can think of right now that your gift guide would make extremely happy. ohhh! this is so good! i love cats!